I have to admit I think I missed out in getting the male gene that makes males lust over big construction equipment. Maybe it has just been dormant, as over the past two and half years our neighbour boy (now 3.5 years old) has been enlightening me on the fascinating world of big machines. It all started on my way home from yoga when I found a book in a Little Library in Hillhurst titled “My Big Big Book of Machines”and grabbed it for him. I must have read it to him a hundred times since then. By age two, he knew the names of over 20 pieces of construction equipment - and so did I. So, when I was offered the opportunity to write a piece for Construction Connect titled “Big Toys for Big Boys,” I jumped at it. Specifically, the assignment was to pretend I was shopping for a big piece of construction equipment, it couldn’t get much better. First stop - Cervus Bobcat. I thought I’d start small and work my way up, but boy was I in for a surprise. Who knew a bobcat could do so many things? In fact, they have a 78-page glossy catalogue titled “We have an attachment for that.” Indeed, they have 80+ attachments that can convert a bobcat into a backhoe, excavator, skid loader, grader, bulldozer, trencher and forklift. They are like mega transformers! From a construction perspective, I am told the bobcat, because of its smaller size, works great on sites with limited space for manoeuvring. The bobcat’s versatility allows it to be used for everything from digging basements and small parkades to lifting trusses into place. It can even clear sidewalks of snow and dirt and then be used for landscaping and fence post digging. There is even a 3D grade control system that allows the driver to quickly and accurately sculpt the land around a new house or larger buildings. I am beginning to wonder how I have lived without one for so long. At almost two year's of age we watched together as a big toy demolished the housed next door. Next stop - Wajax Equipment. 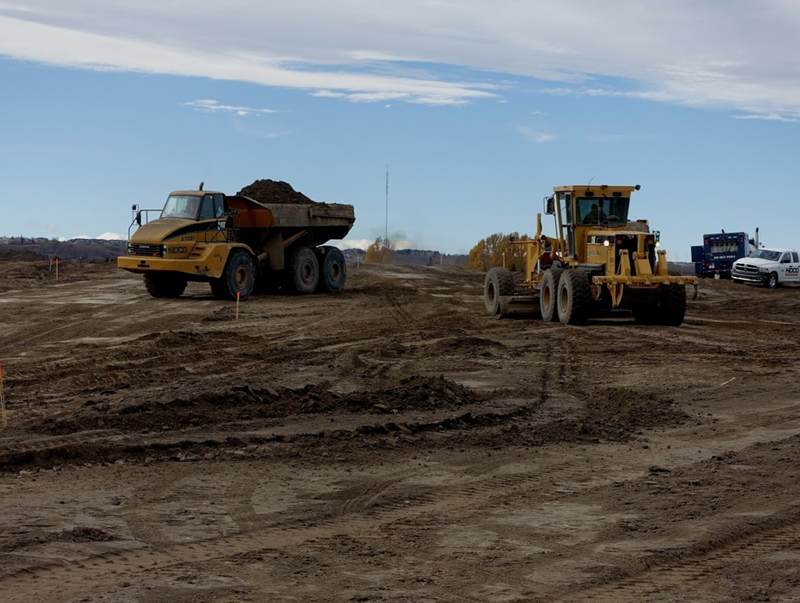 Their inventory included nearly three dozen types of construction machinery including backhoe loaders, skid steers, full size and mini excavators, soil stabilizers, articulated dump trucks, and earthmoving equipment, among many, many others. It is exhausting learning all the names and what they are used for let alone all the details. Almost as complicated as analyzing the golf swing. And, not only do they offer a huge selection of construction machines, but also a choice of brands with intriguing names like Yale, Hyster, Liu Gong, YMZ, Hamm and Wirtgen. Thanks to friends at University District for allowing me to get up into a big toy and see their mega construction site from the a unique perspective. Buying big toys is truly mindboggling to the first time buyer. What I did learn was on any construction site, the excavator is KING, able to be used for demolition, digging and lifting. They come in all different sizes - mini (.5 to 7 tons), midi (7 to 12 tons) and large (40 to 60 tons) and can be equipped with wheels or tracks. I even learned some that can do 60 km/hr. on roadways. Consider the equipment’s availability to rent when you need it. The comment I found most interesting was that when you rent, you are often paying for the newest equipment with the latest technology, which can be more expensive and you may not need or use all of the features (sounds a bit like buying a smart phone). The blog also suggests purchasing well-maintained used equipment can be more cost effective than renting over the long term. Ritchie Bros. sells thousands of pieces of heavy equipment every week through their live unreserved auctions and online marketplaces - IronPlanet and EquipmentOne. Established in Kelowna, BC in 1958 and now headquartered in Burnaby, BC with 110 locations in 25 countries, they opened their first permanent auction site in Edmonton in 1976. Just this past June, Ritchie Bros. sold a 2013 Manitowoc 16000 440-ton self-erecting crane for $2.25M US at a Houston Texas auction. Impressive. Who knew you could learn things on eBay about the dos and don’ts of buying construction equipment. I loved the blog on buying Construction Excavators which gives valuable tips like making sure you know about all of the excavator’s features, parts and functions before you go shopping and lists some of them for you. It suggests asking about things I never would have thought about – like an anti-vandalism feature. And yes, you can buy construction equipment on eBay - they even suggest search words to use. Who knew “zero tail swing excavator” was a good search term. 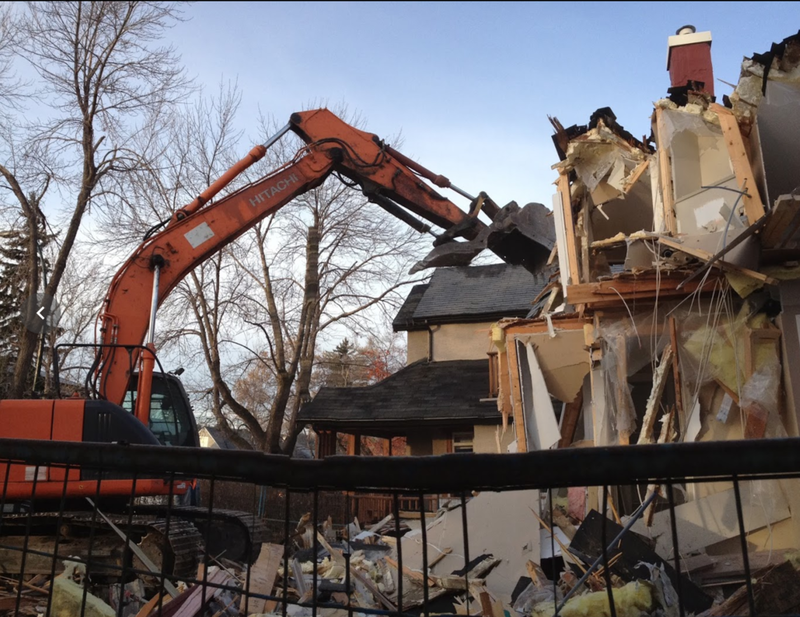 Just for fun, I went on the Calgary Kijiji site and typed in “excavator.” Well, 305 ads came up. On the first page alone there was everything from a 2010 John Deere 350D LC Excavator for $94,900 to a HOC TE301 to a 2006 Hitachi ZX 270LC Hydraulic Excavator for $65,000. On the second page was a Cuso 5327 PD(13-Yard) Hydro-Excavator Truck for $194,000 – very tempting (the little guy next door would be impressed if I had one of these). I wasn’t done yet. More “field research” needed. I asked so I decided to ask my friends at University District if they could set me up with someone to chat with about all the big toys being used to prepare their site for their mega development. I met up with Chris Peters, Project – Supervisor/Estimator – Special Projects with Volker Stevin Contracting Ltd who was wealth of knowledge. I learned that over this summer they had $2.3 million of equipment on site – Two Track Excavators ($1.1M) Track Loader ($300K), Track Dozer ($400K), Wheel Loader (250K), Padfoot Roller ($130K), Smooth Drum Packer ($80K) and Skidsteer ($60K). FYI…they own, not lease or rent. Peters also enlightened me as to what the sequence of events is that takes place to get a bare piece of land ready for housing developers to build their projects. 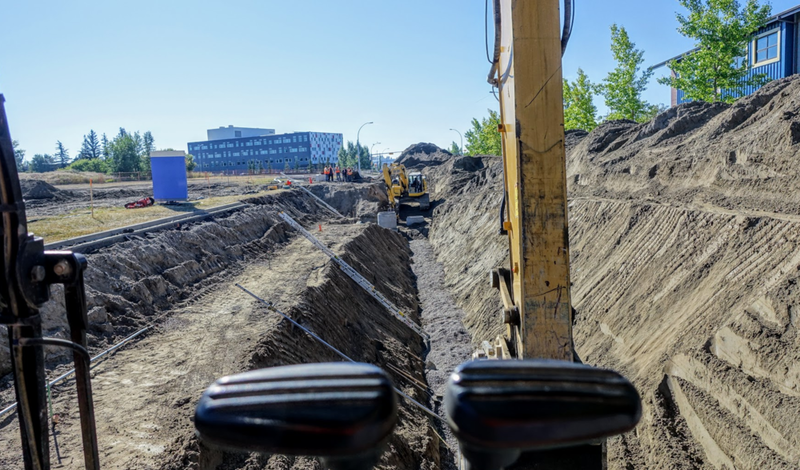 As for what challenges they faced in preparing the University District site, I was surprised to learn some of the pipes were placed 9+ meters deep. I also hadn’t thought about the issue of their working adjacent to the Alberta Children’s Hospital meant keep dust and noise to a minimum and working around traffic and pedestrians. As well, they had to maintain water and services to the all the buildings nearby while performing upgrades. Peters even invited me to come to the University District site and see the equipment for myself, even climb up onto one of their pieces of equipment for an “operator’s view” of what it is like to operate a big toy. I felt like I was the “king of the castle” as little boys would say. Tim, the real operator told me that a good shift is about 10 hours long with about 9 of those actually sitting and operating the equipment. He said, “the bigger the toy, the easier it is on the body as you don’t get bounced around as much as you do on smaller equipment.” Good to know. Part of my assignment was to take at least one piece of equipment for a test drive and perhaps attend a training lesson. My first thought was to check to see what post secondary schools offered heavy equipment operator (HE0) training. I quickly found that Olds College has a 12-week program followed by a two-week practicum - that seemed a bit excessive for my needs. All I needed was a quickie lesson. And no, I couldn’t just train on one or two pieces of equipment either. You must successfully complete training and testing on six pieces of equipment – Grader, Skid Steer, Loader, Excavator, Packer and Rubber Tired Hoe. Nonetheless, a quick call to Sharyl James, Trades Programmer at Olds College was enlightening. She told me they have had students as young as 17 enrolled in the program, but they must be 18 at the time of completion. And they also have had several students over 65 take the training. Guess I have a couple of years yet to take the training. Students have included retired bus drivers, outsourced IT specialists, correctional officers, landscapers, oilfield workers and of course, individuals wanting to start their own building company and do the excavating for their projects themselves. A view from the driver's seat! If you think buying, leasing or renting a new or used car is complicated, don’t even think about becoming a procurement officer for construction equipment. The options are mind-boggling, and a mistake could be very costly. I think I might stick to Toys-R-Us. University District: Calgary's First 24/7 community?